Since 2013, Tinder Press has introduced the literary world to a number of incredible debut novelists that have repeatedly blown me away with their storytelling ability. From Eowyn Ivey’s The Snow Child to Rebecca Mackenzie’s In a Land of Paper Gods, Tinder Press is an imprint whose books can only be described as luscious treats. Their latest offering, See What I Have Done by Sarah Schmidt is no exception to this rule. Based on a true story from the late 1800s, See What I have Done introduces us to the Borden family. The sisters, Lizzy and Emma, their oppressive father and their unwanted stepmother. Soon after the older sister, Emma, manages to break free from the claustrophobic family home, her father and stepmother are found brutally murdered within the locked confines of the house. Emma is called to the scene to discover that only her sister and the maid were inside the locked house when the murders occurred, but both claimed to have heard nothing. Lizzy could not be described as a ‘normal’ woman, she was an adult with the petulant streak and need for attention of a toddler. Emma’s love for her sister runs just as deep as her resentment but as Lizzy’s strange reaction to the murders continues, even she begins to have doubts as to what happened. What none of them realise is that there is another set of eyes that have been watching the house, a man paid to teach Mr Borden a lesson, waiting for his moment to strike. Written from the perspective of four different people, the story of the Boden family is gently unravelled in a number of flashbacks. Sarah Schmidt does an incredible job of defining these characters, especially with the most unlikeable, Lizzy. From every perspective but her own, she comes across as selfish, argumentative and arrogant. But to see the world through her eyes, you start to understand the childlike simplicity of what drives her. If she wants something, why shouldn’t she have it? If she wants someone’s attention why shouldn’t she command it? Which begs the question, if someone hurts her, would she hurt them right back? 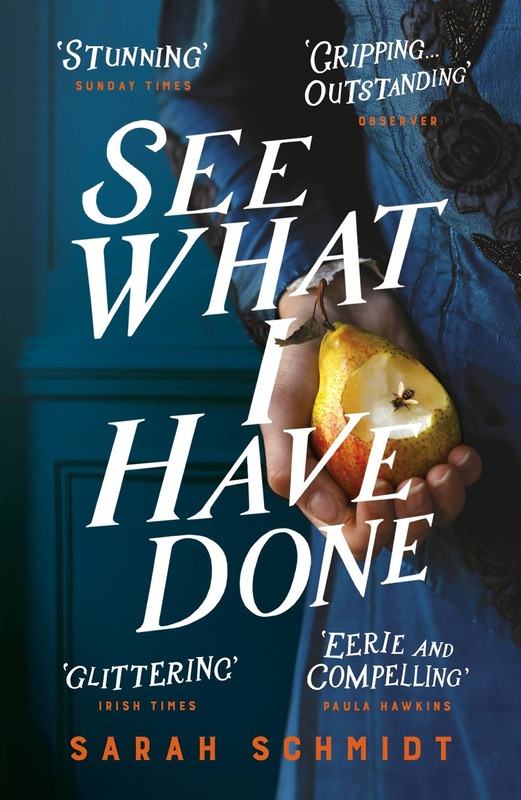 See What I Have Done is a dark tale of murder, family loyalty and questions left unasked. Sarah Schmidt’s short sharp sentences and tiny snapshots of characters inner monologue make for a unique style of writing that feels urgent and adds to the tension between the characters. Sarah Schmidt’s debut is tense, brooding literary novel that had me gripped from the first page to the last.